July 2 2018 – Jean-Sébastien Besner, the 2016 Eastern Canadian Rally Champion, added a long-awaited national victory to his list of accomplishments in his twenty years of car racing by winning the Rallye Baie-des-Chaleurs this past weekend. 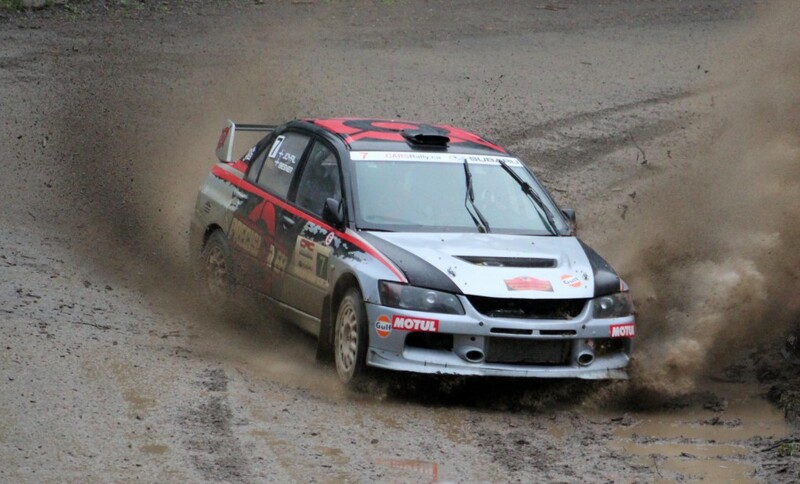 Accompanied by his co-driver Yvan Joyal, the Montreal driver brought his Mitsubishi Lancer Evolution to an overall first place as well as a victory in the Eastern Canadian Rally Championship, after an faultless weekend of racing. This is Besner’s second consecutive victory of the season in the Eastern Canadian Rally Championship, after winning the Lanark Highlands Rally in Ontario last May. With that, he jumps into the lead of the overall championship standings after missing the first event of the season. Yvan Joyal finds himself in third place in the co-drivers’ standings, which is currently lead by René Leblanc. At this weekend’s Rallye Baie-des-Chaleurs, its forty-first edition and the third round of the 2018 ECRC season, Besner/Joyal dominated the race on slick and muddy roads thanks to Mother Nature’s rain showers. They won with a lead of three minutes and twenty-six seconds ahead of local favourites André and René Leblanc (Subaru). The podium, entirely made up of Quebeckers, was completed by Simon Vincent and Hubert Gaudreau (Subaru). Patrick Rainville, co-driven by American Aaron Crescenti (Subaru), finished in fourth place. An excellent performance by the duo was unfortunately capped off with a spectacular crash shortly thereafter, during part of the national event. Fifth place was the scene of a nice battle between two novice teams, both local but entered in different categories : Yves Boudreau/Danny Hudon (Subaru) and Mathieu Leblanc/Éric Dubé, at the wheel of their 2 wheel drive Honda Civic. Boudreau/Hudon broke into the Top 5 and won the Production 4WD Class by a margin of eleven seconds over their next competitors and Leblanc/Dubé claimed 2WD honours as well as an overall sixth place finish. Olivier Martel and Vincent Hubert turned heads in their Subaru during their first ever rally at the Rallye Perce-Neige last February, and they once again had another stellar performance, finishing in seventh ahead of Philippe Benoît/Maxime Gagnon (second in 2WD with their Mini Cooper S) and Maxime Labrie/Anik Barrette (Subaru), who were suffering from transmission issues. The last of the Top 10 overall finishers were Jonathan Conrad and Timothy Dine (Subaru). 25 of the 37 teams entered in this 2018 edition of the Rallye Baie-des-Chaleurs were also contesting the Eastern Canadian Rally Championship. Of them, 18 completed the event. The following outing for the ECRC will be the Black Bear Rally, in the Catchacoma region of Ontario. Initially scheduled for June, the event has since been moved to July 14th.